Get this together before you go to bed and you will wake up to the BEST oatmeal. Put the bowl in the slow cooker. Add enough water in the bottom of the slow cooker (under the bowl) to cover the water/oatmeal line in the bowl. If you have a programmable slow cooker like mine, set it on low for 7-8 hours and it will go to warm after that (which makes getting the bowl of oats out of the hot water bath easier). Otherwise cook it on low overnight, turn it off as soon as you get up. In the morning you can top with whatever you like: the traditional raisons, maple syrup, milk and cinnamon or try it straight up with a fried egg. Now that you have had breakfast and your slow cooker is till clean, make dinner. Prep the veg the night before so you can throw this together in the morning. 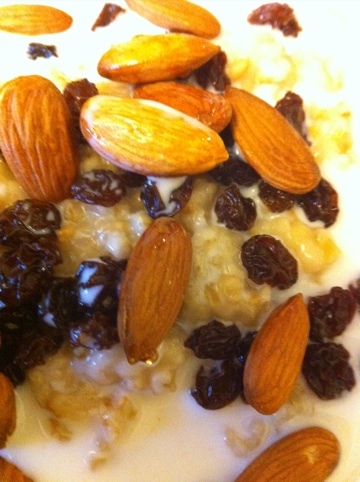 This entry was posted in Breakfast, Recipes and tagged Slow Cooker. Bookmark the permalink. Both comments and trackbacks are currently closed.